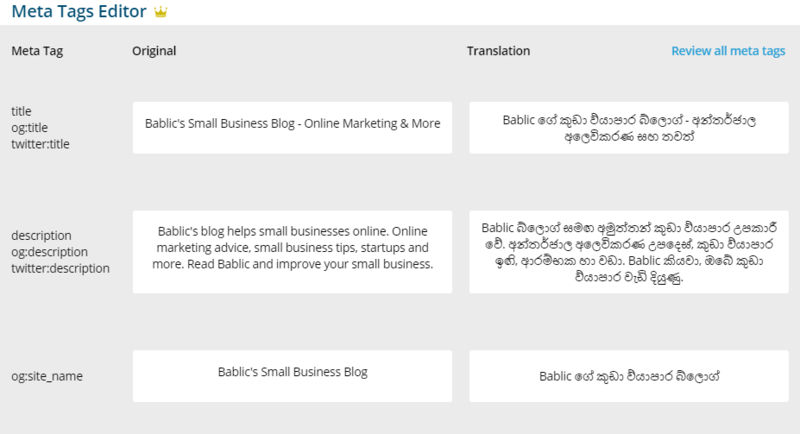 In Bablic, you can translate the pages meta tags just like an other content, using Machine Translation, Professional Translation, or by editing it manually. You'll see a table of page meta tags, with their original text and translation text boxes. Edit the translation, click Apply, and Publish Changes for the translation to be live. If you wish to edit all website meta tags in one location, click "Review all meta tags" to open the Text Editor with all meta tags filtered.